Word of the Day: DWEPEN, idolize – Welcome to the Direct Dutch institute, The Hague. There is no getting away from it… The streets and the houses are orange, people are dressed in orange and everywhere you look, you see orange flags with pictures of lions. All supermarkets hand out orange knickknacks and when the match is on there’s not a living soul to be seen in the streets. 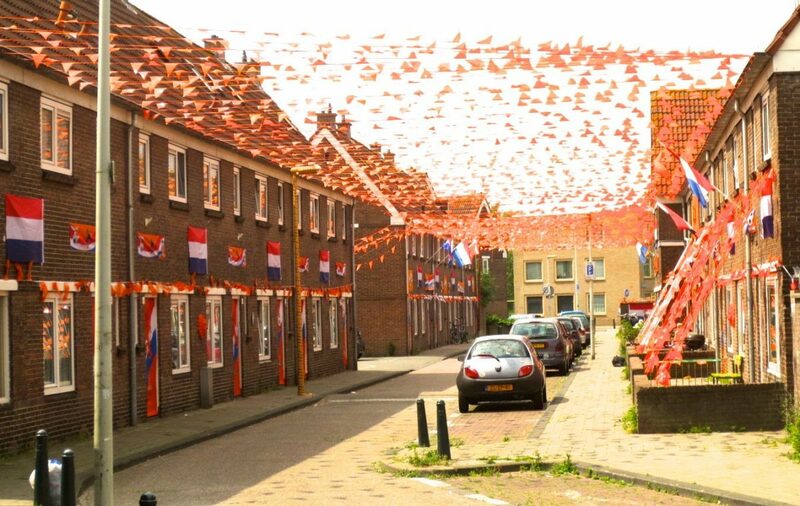 Yes, it’s that special time again, the time when the Dutch are allowed to be ‘dweepziek’ (fanatical). It’s World Cup time. ‘The Dutchman idolizes Robin van Persie’. ->‘De Nederlander dweept met Robin van Persie’. The word ‘dweepziek’ consists of two words: ‘dweep’ (which is from DWEPEN) and ‘ziek’ (sick or ill). When someone calls you ‘dweepziek’ you must have crossed the line of normalcy in your behaviour and people think you’re obsessed or fanatical. It’s strange that the verb DWEPEN has no exact equivalent in English. And yet, I know that the English or the Americans can be just as ‘dweepziek’ as the Dutch. German has the equally lovely verb ‘schwärmen’ (für). The French use ‘adorer’ but this verb does not really match DWEPEN or German ‘schwärmen’ in my opinion. Or is there another French verb that expresses fanaticism? DWEPEN has an unfavourable connotation but scholars say that it stems from the positive biological need to learn. Young children imitate the behaviour of the people they idolize, their parents. That’s how they learn. Apparently humans do not lose this quality when they grow up. When football lovers watch a match, they fantasize that they are out there in the field. They see themselves reflected in the movements of their heroes and DWEPEN is the result. Someone who DWEEPS is not a ‘dweeb’. The American slang word ‘dweeb’ is not at all related to Dutch. The dictionary suggests that it is a combination of ‘dwarf’ and ‘feeb’. A ‘dweeb’ in Dutch is a ‘watje’ (lit. a wad of cotton wool), a ‘doetje’ (softy), an ‘eitje’ (lit. a little egg), a ‘sul’ (dope), or an ‘oen’ (dummy). If you want to join the Dutch ‘dwepers’, it helps to know the song that the Dutch singer Jan Smit and the Dutch actor Johnny de Mol are singing for this World Cup. Everybody sing along! Here it is.